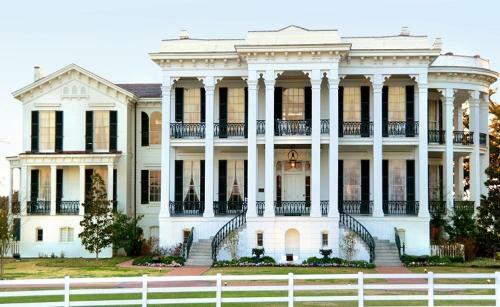 When you arrive at 31025 Highway 1 in White Castle, Louisiana, and spy a literal “white castle,” you will immediately be enthralled by the magnificence of Nottoway Plantation and Resort. With 53,000 square feet (~4925.8 square meters), it is the largest antebellum mansion to be found in the South that survived the Civil War. On the beautifully-manicured 31 acres (~12.5 hectares) surrounding it, you will discover two ballrooms, tennis courts, a pavilion, a hair and nail salon, 3 bridal dressing salons, a pool, a gift shop, a fitness center, a restaurant and a cafe, not to mention 200-year-old oak trees standing guard over the property. The location is perfect for a corporate retreat, a wedding, a honeymoon, a special occasion of any kind or maybe just to gather before a fall football game being played by the Louisiana State University Tigers in nearby Baton Rouge. Nottoway is 25 miles (40.23 km) from Baton Rouge, 70 miles (112.65 km) from New Orleans and 75 miles (120.7 km) from Lafayette. Very fortunately, many people have only a short distance to drive to enjoy this history-packed, luxury resort. Guests may choose from a wide range of accommodations in order to meet their needs and wishes most appropriately. Seven rooms and a suite are actually available in the mansion itself. They have each been updated to include private bathrooms, but you are still able to experience the flavor of living in 1859. 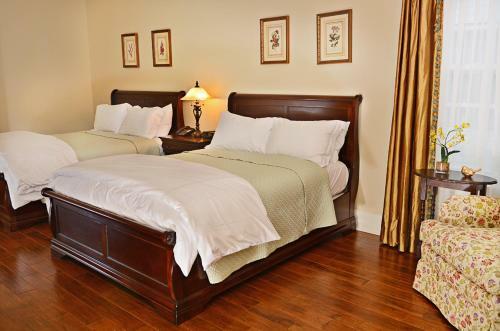 The Overseers Cottage and the Carriage House provide guest rooms, plus there are luxury hotel rooms in the cottages. Each cottage has two units that share a porch with oversized rocking chairs, and two honeymoon suites can be reserved. John Hampden Randolph commissioned the building of this mansion and wanted a place to display his enormous wealth. He and his wife Emily Jane had 11 children. Many of the guestrooms and suites are named for members of the Randolph family. Nottoway is not only a AAA Four Diamond facility, it is also on the National Register of Historic Places. Overnight guests have access to the Fitness Center as well as to the outdoor pool and cabana with hot tub. Each room has a flat screen television with cable, free Wi-Fi, a coffee maker with a variety of coffees and teas, an alarm clock with iPod dock and all of the other items that discriminating visitors have come to expect. One of the privileges of staying at Nottoway is having access to walking trails along the levee and being able to see the Mississippi River. You don’t have to wait long for a ship or barge to go sailing past. Once you check in, you will want to stay right where you are for dinner and then for breakfast the next morning. The ground floor of the mansion houses The Mansion Restaurant, a romantic setting with fantastic food. The dinner menu features lots of regional Louisiana specialties and a wide price range so that you can order soups, salads and sandwiches or a full dinner with appetizers. Breakfast is a lavish buffet, or guests may order a la carte. Le Cafe is available for a “Louisiana meal-to-go” lunch for your convenience after a tour or when you check out, but The Mansion Restaurant offers a full lunch menu, too. In addition to traditional guided tours conducted by knowledgeable costumed staff members, you can now have a self-guided audio tour if you wish. With audio tours, you can go at your own pace, and they can be taken any time from 8:00 a.m. to 8:00 p.m. Don’t leave without learning about the history of this sugarcane plantation and the Randolph family. If you live near Nottoway Plantation and Resort, you have the opportunity to drive out for dinner, for Sunday brunch, a tour or for a beautiful wedding. But, if you really want to pamper yourself and splurge, go for a night or a weekend. The culinary skills of Executive Chef Michael Loupe and Executive Sous Mike Sims are exceptional. The rooms have been designed with your utmost comfort in mind. And you can be entertained royally as were the guests of John and Emily Randolph 160 years ago.